It’s late on Jan 31, the DCA510 exam is now dead – long live VCAP5-DCA! In celebration (because, trust me if you are interested in becoming VCAP5-DCA certified you are much better off taking DCA550) I’m posting some DCA550 goodness. I’ve listed some of the specs here before, as well as in the forums. A candidate pulled that into a Visio graphic and shared it with me, which got me to thinking – the management interface has a pretty nifty view I could edit a bit for clarity that might help those building lab environments to match. Plus while I’ve posted the DCA510 desktop before I don’t think I’ve put up the 550. If only one last-octet is listed for a machine with several nics, all have that last octet (if the interface is configured). Note that all of the VMs listed there are “top level” or “first virtualization” level. 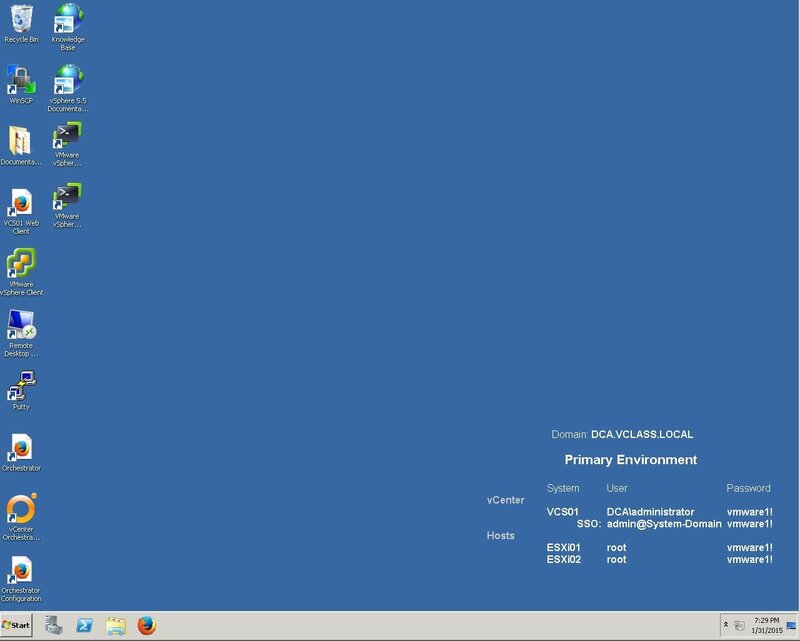 If you are building this nested (like on Workstation) these are the VMs in Workstation. There are many more components to the exam environment incl replication and vMA but all of those run nested on the hosts you see in that diagram. I’m working on a new Test Track environment to emulate DCA550 (DC and hosts created already). Hopefully it will done soon. This entry was posted in Certification, Computing, Virtualization, VMware and tagged certification, DCA, VCAP5-DCA, vmware, vSphere. Bookmark the permalink. Nice, good luck and appreciate all your effort!! Josh thank you once again for all the time and effort you are putting into this. The new material in VDCA550 its one of its best features (its not about getting a certificate but being better at what we do), these two resources helped me…. That’s not part of the lab environment, take it at VMworld/PEX. Nice. Great job for us!!!! I recommend Joshua’s test track. It really helped me to test myself before VCAP5-DCA. Hi, really looking forward to the new test track…even better if its available before my exam in March!! I notice that there is mention of the vMA but that isn’t specifically listed in the DCA550 blueprint. Is it safe to assume this will be an area that is tested on? I’ve used it a bit but haven’t fully covered it in my study (yet!). You can be expected to log onto a vMA appliance at lease once during the exam, but there is not a focus on the vMA. What’s the point now with the VCIX track announced now replacing the VCAP :-/. Thinking about waiting on my next attempt of the VCAP550 to just go to the VCIX. People were clamoring to take the DCA4 when it retired and they lined up in droves to take DCA510. DCA550+DCD550 will be good for a while yet to advanced to VCDX. VCIX is not really much of a change from the expected “VCAP6” except now you’ll need two big exams to get one certification. I am sitting in the 550 class right now. Talk about timing! I’m curious if you could provide some info on if This is a home lab. I am going to be building a home lab shortly. Never done it before and wondered if you had any helpful hints. I posted the real exam vApp and desktop. I am building TestTrack 550 to replicate the environment for practice. Which class? Who’s the instructor? Hi, could you send me more info about this environment? I’m trying to replicate it at my lab. thanks.